These are uncomfortable times for our nation and it has nothing to do with policy debates in Congress, threats of nuclear annihilation or natural disasters. No, dominating the discussion in so many households across America are the near daily revelations of new charges of sexual assaults against women by men none of us would have guessed. And others hurt by men who’ve been known serial predators for decades, and whose league of fans and family simply shook their heads and turned a blind eye. Bad behavior by powerful men has been tolerated in this country for too long. Accusations of sexual misconduct, which is a nicer term than what much of this has been, is non-partisan. What we’re reading and hearing is more a reflection of brave women coming forward than it is a sudden spike in the number of men committing these crimes. It’s time for men who believe themselves to be decent and good to do more to stop it. If it’s happening in Hollywood and Congress and at some of the country’s best-known media outlets – National Public Radio and the New York Times – you can bet it’s happening in companies, on campuses and in communities throughout our country. I have two young boys. I want them to grow up to be honest, responsible and compassionate citizens. Most of all, I want them to be decent and good men. That starts with me and how I lead my life and with how I respond to ugliness. As business owners, my wife, Mollee, and I always have treated our employees and campaign team as part of our family. Along the way, we learned that even family members are flawed. We have experienced firsthand the highs and lows of business ownership including when a team member falls short of expectations. We always have made very clear our standards of behavior to our employees, and my campaign for the Republican nomination in Indiana’s Congressional 6th District is no different. The national headlines of the past few weeks have made clear the importance of what Mollee and I would classify as old-fashioned common sense. It is unfortunate that we live in a world that doesn’t seem to understand common sense. We have a zero-tolerance policy for inappropriate behavior both in and out of the workplace. Our behavior, the behavior of our employees and that of our volunteers working with us reflects on our entire team, reflects directly on our district, on Indiana, and on our country. The whole reason that my wife and I feel led to this office is that it is time for a new generation of leadership that rises above the status quo where business-as-usual-thinking-and-behavior is good enough. This campaign team is a melting pot of backgrounds, genders, ages, races, sexual orientations, and religions. Though we come from different walks of life, we all must share a set of common values where “right” is right, and “wrong” is wrong. So, if you’re feeling uncomfortable about the conversations about this topic, good. It will take all of us to stop this behavior. 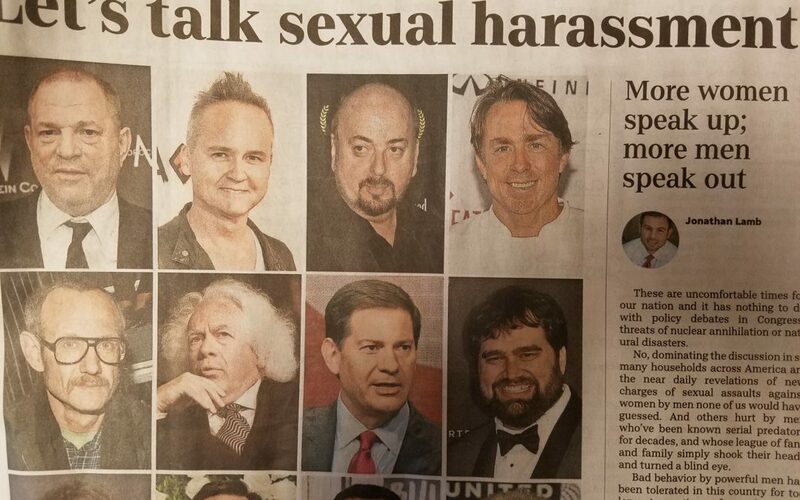 It will take women who speak up and men who speak out. Jonathan Lamb is seeking the Republican nomination for Congress in Indiana’s 6th District. He grew up in Yorktown, Ind., lives in Muncie and has been an entrepreneur, owning businesses from agricultural technology to franchised childcare centers.